Dehradun’s Pradeep Rana has a set a new world record in cycling. After setting the world record, Pradeep Rana received a grand welcome with huge pomp and show in Graphic Era Hill University, where he is currently a student pursuing BSc IT, after a long and arduous journey of 162 days across difficult terrains, plains and mountains alike, in the scorching heat and the violent rain across the nation. A student of Graphic Era, getsa grand welcome and Rs1 Lakh cash prize. Dehradun 1st November: Dehradun’s Pradeep Rana has a set a new world record in cycling. After setting the world record, Pradeep Rana received a grand welcome with huge pomp and show in Graphic Era Hill University, where he is currently a student pursuing BSc IT, after a long and arduous journey of 162 days across difficult terrains, plains and mountains alike, in the scorching heat and the violent rain across the nation. Pradeep Rana cycled a total distance of 18300 km and reached the Graphic Era campus to the familiarity of his fellow classmates and a warm welcome from the Graphic Era fraternity, all gathered under the warm November sun to cheer this unimaginable feat. So immense was this accomplishment of Pradeep Rana, that the Chairman of the Graphic Era Group, Prof. Dr. Kamal Ghanshala, announced an award of 1 lakh rupees as token of his determination and hard work. A student of BSc (IT), Graphic Era, Pradeep Rana, embarked upon this difficult journey on 23 May from Graphic Era campus. 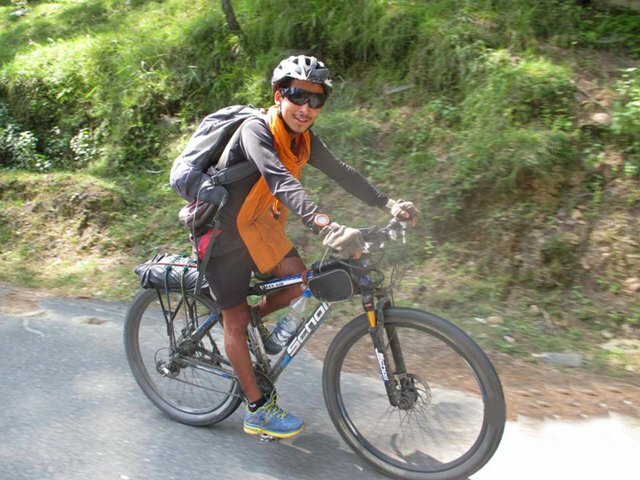 He cycled continuously for 5 months and travelled from Tamil Nadu to North East India and to various other states in Northern India, Pradeep Rana reached the university premises around 12 o’clock in the noon. Sharing his experiences about the journey, Pradeep said that, “During my journey I met people from different dialects and culture, and faced lot of difficulties, but because of University’s support and motivation from my friends of Graphic, I could make this happen”. Pradeep added that, he wants to set a new world record that goes beyond national boundaries and travel the world on his bicycle. Prof DrGhanshala said that this achievement is a moment of great pride for not only the state but also the whole nation. He said, “ I want other students to take motivation from him and set new records of success and bring name and fame to their country”. Disclaimer: The information provided in this Notification is solely by Graphic Era Hill University, Jagranjosh.com bears no representations or warranties of any kind, express or implied, about the completeness, accuracy, reliability, suitability or availability with respect to the information. Individuals are therefore suggested to check the authenticity of the information.